Duck Foot Brewing Company, established in San Diego is expanding to East Village with its gluten-free beer and menu. 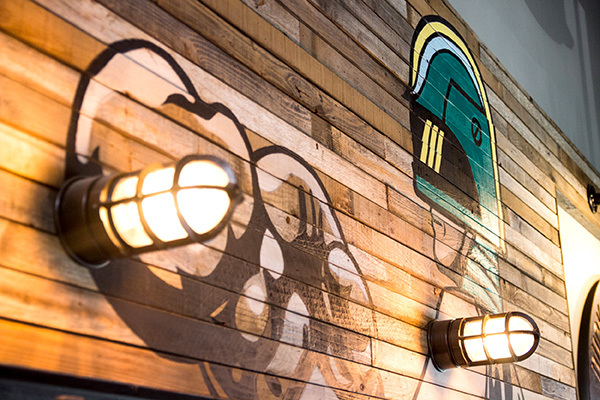 Duck Foot Brewing Company — established June 2015 in Miramar — is expanding to East Village and currently in construction at 550 Park Blvd., in the space formerly occupied by The Parlour. In Duck Foot’s last 2.5 years of operation they’ve grown rapidly, distributing to taps and shelves throughout San Diego county. Owners Matt Del Vecchio, Brett Goldstock and Suzy Pesutti are all New York transplants looking forward to re-joining the busy city environment of East Village. The tap wall at Duck Foot East Village will sport 16 taps, including limited releases not available elsewhere. Some of Duck Foot’s most notable brews to be tapped at Duck Foot East Village include their silver medal-winning Drink This or the Bees Die Honey Ale, double gold medal-winning London Calling Imperial Porter, silver medal-winning Duckzilla Double White IPA, and their Secret Spot Hazy IPA — a collaboration with North County surf artist Andy Davis. 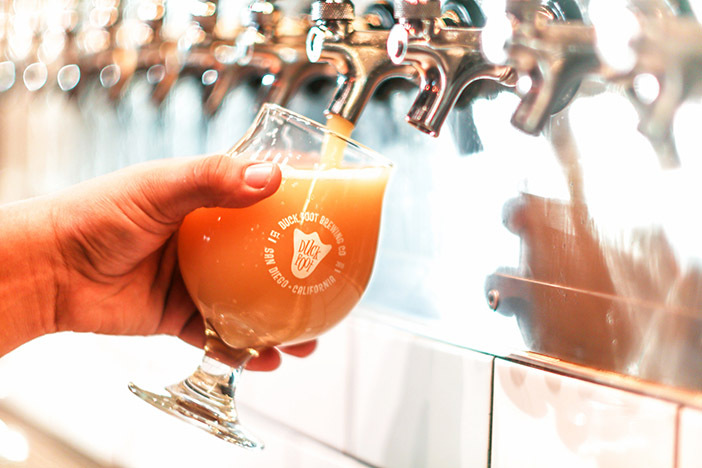 This East Village location will also be Duck Foot’s hub for gleaning customer feedback for research and development, with many specialty small batches and barrel-aged beers pouring through its taps. Since all Duck Foot beers are brewed using a special process to reduce gluten and maximize flavor, the menu will feature all gluten-free items geared towards the moderately health-conscious and gluten-ambivalent. In other words, just like its beer, its food won’t taste gluten-free. As with much of Duck Foot’s beer, the menu will reflect the fresh flavors of the region. A few notable items include: Peachwood-smoked olives; a strawberry salad with arugula, green garlic, goat cheese and peanut brittle with strawberry-sherry vinaigrette; a cucumber salad with gazpacho water, corn, green tomato, shaved cucumber and aleppo; a broccoli salad with smoked soy, sesame, leek, yuzu, ginger and coconut; cauliflower popcorn with snap peas, basil, yuzu, and peanut vinaigrette; poke with chile kewpie, chicharron, smoked soy and cilantro; and a selection of heartier dishes currently under critical review by Duck Foot’s merry tasting panel. The Duck Foot team is excited to be a part of the East Village community and projects an opening date in mid-June, with a few soft-open events preceding that, just for residents and business-owners in East Village. As Duck Foot expands into East Village, it also expands its team, with the addition of Suzy Pessutti, heading retail operations, and Austin Copeland, joining the brewing team as head-brewer. Pessutti, like her husband Brett, is a former Qualcomm employee who has moonlighted at Duck Foot since before its inception. In other words, she’s part of why Duck Foot is, well, Duck Foot and is now a full-time team member. She will be spending plenty of time at the new location in East Village, so say hi when you stop by! Once Duck Foot East Village is open, they plan to host an array of events, from food pairings to special taps and holiday events. Plus, the occasional event for the hell of it because why not? To stay updated on Duck Foot East Village’s opening, visit their website (duckfootbeer.com), follow them on Instagram (bit.ly/2Kq7rx1), and like their Facebook page (bit.ly/2vV8QZ4). As always, take a stance for better beer and #goduckurself. — Dora McCann Guerreiro is the executive director of the East Village Association. To learn more, visit eastvillagesandiego.com or you can reach her at dora@eastvillagesandiego.com.